Hot/Cold therapy is a long time source of relief for just about everything anymore. Pain, cramping, sprains and strains, and more recently sunburn, and fevers. But getting a child to hold onto a cold ice pack when they have a fever, it’s impossible… A sick child doesn’t want to hold onto anything but you and maybe their teddy. So when I found Thermal-aid animals, I knew they were a perfect fit for my readers. Check this out, you can heat them or cool them down. Now personally I like heat…. I like the adult packs that Thermal-aid offers because the corn technology they have developed produces a clean and long lasting heat. But for our sick kiddo’s, Thermal-Aid offers this same technology in animals, such as bears, monkeys, and even a rabbit. Thermal-Aid products can be heated up easily in the microwave. I was really surprised how long Jo-Jo the Monkey stayed warm after we heated him up. Instructions were included to prevent overheating but in just a few minutes Jo-Jo was ready. For the cooling therapy, approximately 5 hours in the freezer and its ready to go. I am so glad that we found Thermal-aid, the high quality heating and cooling therapy without the high cost. The products are not only efficient but really adorable to! What would you use Thermal-Aid for? I would love to have a ThermalAid animal for my little one. He hates using icepacks and the like because he has supersensitive skin and icepacks really hurt him. Something like this would be perfect for him. It would be a GREAT gift for my friend who just gave birth. Thanks for the giveaway. My toddler granddaughter has been sick a lot this winter. Also sounds good for sore knees. My daughter would love this when she's sick. I love the idea of kid friendly designs. I know it would help my little ones be more ready to keep something on or near them when they need it. 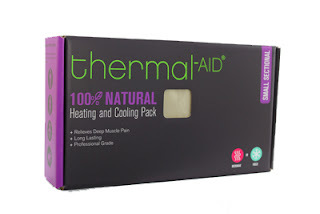 I would love to try thermal aid because I have a bad back & think it would definitely help. This would be such a sweet way to comfort my grand babies. I think this would be great for my husband's lower back pain. I have problems with my back and also serve nerve damage in my leg, I heard these are wonderful and conveince. This would be so comforting for my little one! I would love to have this for the grand kids!